The Hamlet Historian magazine and website supports the planning application that includes the rebuilding of the Champion Hill Stadium on the site of the Astroturf on Greendale. The ground will be 4,000 capacity and to National League standard, with a 3G pitch. This will mean fewer postponements due to bad weather and a truer playing surface. We would urge all Dulwich Hamlet supporters to contact Southwark Council’s Planning Department in support of the proposed new ground development (16/AP/1232). The well thought out plans that have been put forward by Hadley, the owners of the club, to my mind, will benefit the local community in a wonderful way and ensure Dulwich Hamlet Football Club has a bright future. Dulwich Hamlet FC was this week awarded the prestigious Football Foundation CommunityClub of the Year Award for 2016. That is a fantastic achievement and genuinely deserved by the Club and its amazing set of supporters, who in recent years have done so much to bring to the fore the charitable spirit and community atmosphere that abounds at Champion Hill. Thousands of pounds have been raised for various schemes and charities. It is what marks our club out, hence the award. As well as the unique character of the Club and its fans, few other clubs at the same level can match our rich and glorious history. For decades Dulwich Hamlet was one of the finest amateur teams in the country with tens of thousands visiting the ground week in week out. Yet, despite this wonderful history, it is THE FUTURE that is far more important to the Club. The real concern is that if they are not given the go ahead for the new ground on the adjacent piece of land, we may sooner rather than later witness the demise of Dulwich Hamlet FC. Hadley’s proposed development – which will mean the Club will take the significant step of becoming a supporter-owned club – relocates the Club to the site of Greendale’s AstroTurf pitch. This could not be a better move for Dulwich Hamlet, as it would mean a return to the exact site they played on from 1912 to 1931. A new all-weather pitch and improved facilities will not just be in use on matchdays, but will provide a permanent base for Gavin Rose’s Aspire Academy, so critical to the development of future Hamlet players, and will also be available for schools in the area on weekdays as well. So if you want to ensure our great club survives, and provide a lasting legacy for the local community, make a comment at Southwark Council’s website. One of the displays at the recent Dulwich Hamlet Pop-Up Museum showed some items relating to cricket. Some might have found this a bit unusual as the main emphasis was on the football club. However, the Dulwich Hamlet Cricket Club was hardly a separate entity, as it was made up of players from the football team ...in a different set of togs. The DHCC, which eventually folded in the 1990s after a century, had always maintained a fixture list against clubs of highest reputation. And that quite was understandable when one realised the calibre of player in the Hamlet sides. Among those who wore the pink and blue of the football club and the ‘whites’ of the cricket club were Laurie Fishlock and Geoff Whittaker (both seen above), Arthur McIntyre, Leslie Todd and Arthur Phebey – all of them more famous as county cricketers than footballers. If selected for the Hamlet team, whether cricket or football, the player received a postcard or telegram instructing him where to meet. The 1950s ephemera we included belonged to Berard 'Bunny' Bullock. On display was a Football programme from Saturday 6 September 1952 and a Cricket programme from the following day Sunday 7 September 1952. Some players partook in both matches. In January 1893 a couple of senior pupils of Dulwich Hamlet School in Dulwich Village handed over to Pa Wilson a handful of coins. 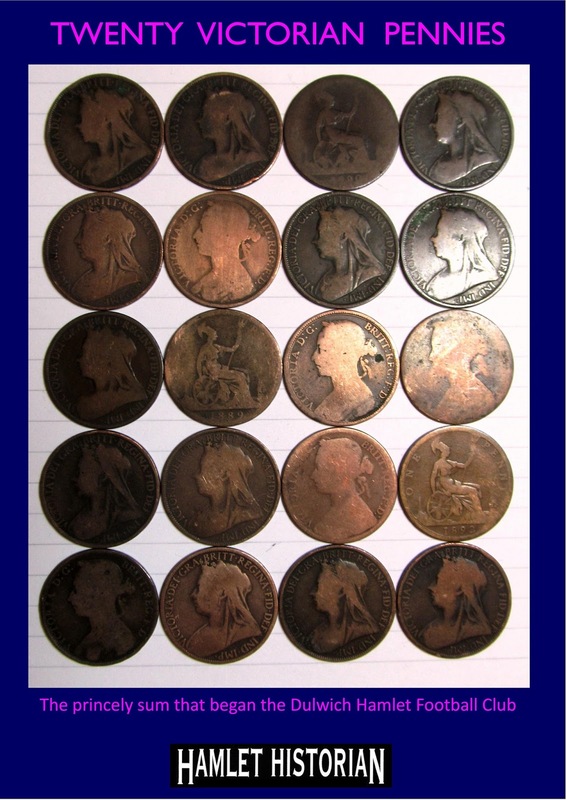 The one shilling and eight pence – or twenty Victorian pennies – was to help them start a football club. One of the lads was goalkeeper James RossWilliamson, who later became Club Secretary. A series of friendly matches were soon undertaken, but all were lost. The players then spent the summer on the cricket field, until football season once again commenced. Rules were written up – one interesting one being that the original Club colours were dark blue and RED, and yet the team strip consisted of a white shirt and dark shorts! Dulwich Hamlet began its first ‘full season’ of competitive football in 1893/94. Fixture cards were printed up and distributed to players, officials and the small band of supporters. Many years ago one of these artefacts turned up with all the changes, postponements and results pencilled in. Home matches were played at Woodwarde Road in Dulwich, while away matches took place at Brockwell Park, Streatham Common, Peckham Rye, Norbury Park and Dulwich Park. Some of the scores make it very clear that Dulwich Hamlet FC was a formidable local force even in its infancy. England international Edgar Kail was by far Dulwich Hamlet’s most illustrious player. A skillful inside-right, Kail won 21 Amateur caps and 3 Full caps (versus France, Belgium and Spain in 1929). The cap in the picture is from March 1924 when England beat Wales 2-1 in Llandudno. 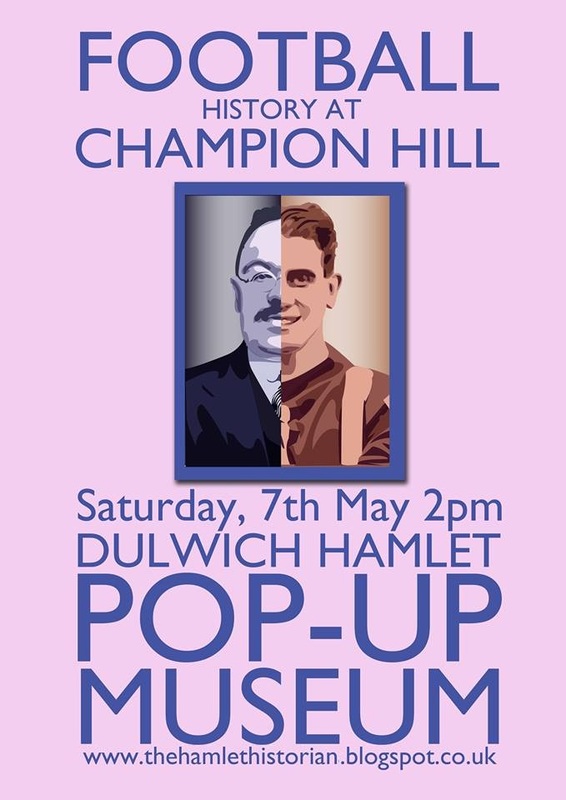 The Dulwich Hamlet Pop-Up Museum was a great success, with about 60 or 70 people coming along to see some of the things we had on show. The highlights included an England cap of the legendary Edgar Kail, the shirt that Ernie Toser wore in the 1937 Amateur Cup Final and the winner’s medal that he won three years earlier in the same competition. The walls of the boardroom are decorated with pictures as it is, and first time visitors were in for a treat. Added to that there was also a chance to view a number of rarely seen team photographs, programmes, picture cards, posters, autograph books, handbooks and other ephemera from my own small collection. The most popular item on show was Sid Simpson’s pink and blue striped cricket blazer. Some suggested that if we were to reproduce them they would be a big hit on the terraces at Champion Hill. Another highlight was a newspaper report after the 1932 Amateur Cup Final when Edgar Kail put on one of his greatest displays. The relevant section can be seen below. It was a great joy to flick through a series of scrapbooks from the 1940s and 50s that Alex Crane brought along, and chat with young and old about the rich and glorious history of the Dulwich Hamlet Football Club. There was a wide range of visitors from 96 year old Bill Kirby, our most senior supporter, down to one year old babe in arms Oisin Molloy-Vaughan. Although Bill first saw Dulwich in the 1930s, more than half of those who signed the visitors book saw their first Hamlet match in the 21st Century. On Ebay at the moment there is an autograph up for grabs. With a starting bid of just 99p you might just get lucky. The ancient sheet of pink paper is hand-signed by Dulwich Hamlet's England international goalkeeper E.H. 'Tim' Coleman. Coleman kept goal for the Hamlet either side of the First World War and was a member of the Victory side of 1920. That team won the double - the Isthmian League and the FA Amateur Cup, and one or two other pots as well. Coleman played for the full England side eight years before Edgar Kail made his three apearances. 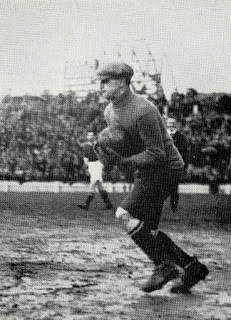 Coleman gathers the ball for England v Wales in Cardiff, March 1921. 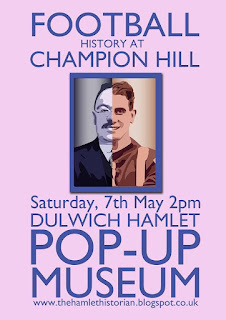 The Dulwich Hamlet Pop-Up Museum will be open on the afternoon of Saturday 7 May. On display will be another of 'Tim' Coleman's signatures. This one with the whole Hamlet team on the back of a postcard. The exhibition is for one day only - opening at 2:00pm until 5:30pm. We look forward to seeing you. It gives us great pleasure to announce that the Hamlet Historian will be setting up a Pop-Up Museum in the club boardroom for the afternoon of Saturday 7 May 2016 from 2:00pm until 5:30pm. At 3 o’clock the same day a Dulwich Hamlet XI will play a match against the Dulwich Hamlet Supporters Team. I have played in a couple of these matches myself, the first of which was my debut for the Supporters Team over twenty years ago. I will never forget the game because I had to mark my hero Frank Murphy in the first half and Player of the Year Gary Hewitt in the second half! So put a note in your diary to come along and support this event, and others over the same weekend. Details can be found at the Dulwich Hamlet website. The Dulwich Hamlet FC boardroom is almost a museum in itself anyway, and the club have graciously allowed us to use it for a couple of hours. If you have not been in there before it will be well worth taking this opportunity. Feel free to come along and say hello and check out some of the exhibits and memorabilia that we hold. Among the items on display will be one of the legendary EdgarKail’s amateur England caps, Ernie Toser’s Dulwich Hamlet shirt from 1937 FA Amateur Cup Final, and one of his two winner’s medals. The Ernie Toser shirt, which he kept in a drawer for decades, was the prototype for the popular TOFFS retro shirt. If you have any Hamlet related paraphernalia that you would like to bring along to show us, we would be more than pleased to see you.